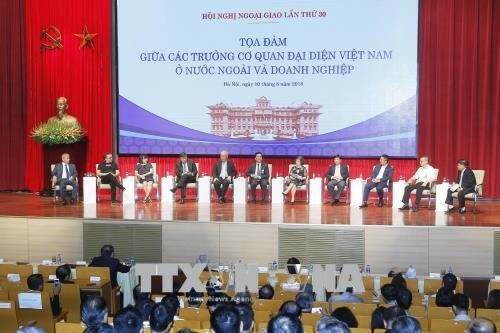 (VOVWORLD) - The 30th Diplomatic Conference will be held from August 12-17 in Hanoi with the theme: "Vietnam's diplomatic work: Proactiveness, Innovation, Effectiveness towards successfully implementing Resolutions of the 12th National Party Congress". The conference aims to gauge the implementation of Resolution of the 12th National Party Congress on foreign relations in the last two years and seek ways to succesfully carry out the Resolution in the coming years in preparation for the 13th National Party Congress. It will also devise ways to fully tap opportunities and overcome challenges to implement the Party and State’s foreign policy in an active, creative and effective manner to elevate Vietnam’s profile worldwide. The conference will work out measures to effectively promote international integration and multilateral diplomacy of Vietnam, contributing to national construction and defense.